The settlement of the maritime boundary disputes between China and Japan in the East China Sea, and between Greece and Turkey in the Aegean Sea, is politically deadlocked. While diplomatic settlement efforts have been ongoing for the past several decades, neither side in each case appears prepared to back down from its respective maritime and territorial claims. Several incidents at sea have occurred, prompting diplomatic protests, military standoffs, even exchange of fire. The existing status quo is inherently unstable and does not favour either side to the extent that it holds hostage the multiple benefits that could otherwise be generated from the exploitation of the seabed energy and mineral resources in the disputed waters, creating an urgent need for a meaningful discussion on finding a practical way forward. 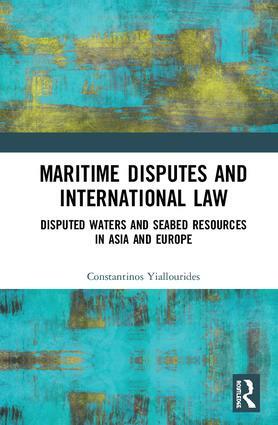 This monograph undertakes a comprehensive analysis of these disputes based on the rules and principles of international law, critically evaluating possible institutional designs of inter-State cooperation over seabed activities in disputed maritime areas and makes recommendations for the prospect of realising joint development regimes in the East China Sea and the Aegean to coordinate the exploration for and exploitation of resources without having resorted previously to boundary delimitation settlement. International cooperation over seabed activities? Why now? A joint development zone in the Aegean? Dr Constantinos Yiallourides is the Arthur Watts Research Fellow in Public International Law at the British Institute of International and Comparative Law, specialising in maritime and territorial disputes. He advises States, international organisations and other entities on matters of international law.